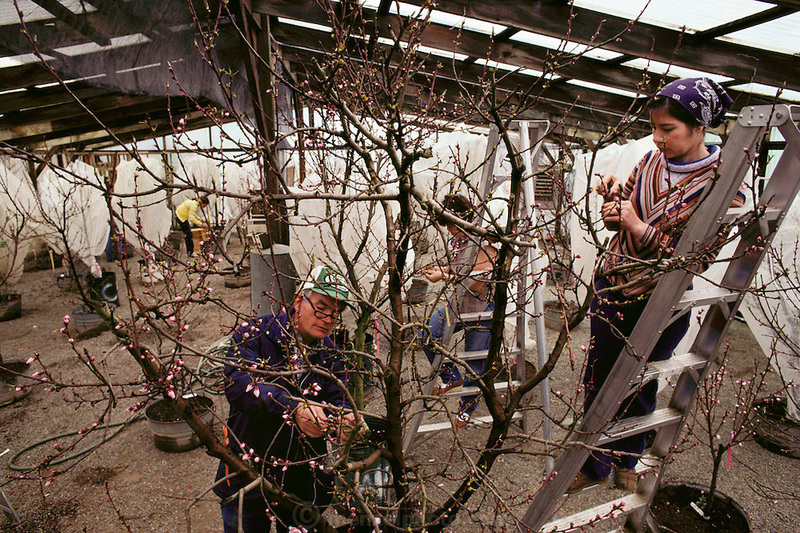 Floyd Zaiger, with two women workers on ladders, emasculate blossoms in the Zaiger's greenhouse. Flower petals and buds are removed to leave the pistol exposed, which is then hand-pollinated with brushes or cotton swabs. Blossoms are collected by hand from specific trees in the orchards and pollen is extracted from them by cutting the flower up with small scissors and sifting the parts. The pollen goes into a small plastic bottle that is numbered and stored in ice chests. Many trees are grown in barrels that are moved into the greenhouse to be worked on or to speed up or slow down pollination and development. Floyd Zaiger (Born 1926) is a biologist who is most noted for his work in fruit genetics. Zaiger Genetics, located in Modesto, California, USA, was founded in 1958. Zaiger has spent his life in pursuit of the perfect fruit, developing both cultivars of existing species and new hybrids such as the pluot and the aprium. -MODEL RELEASED. 1983.